These best-in-class cards, some of which are from our partners, will earn you lucrative rewards when you're filling up your tank or your belly. Check out our shortlist to uncover the names of these leading cards. This card provides 2% back on groceries and offers gas as an option for the 3% bonus category of your choice. Plus the card includes other versatile perks such as a 0% intro APR offer, best-in-class intro bonus, and no annual fee. Earn up to 5% cash back each quarter on rotating categories you activate that have included gas, groceries, and more everyday essentials. The fact the card includes no annual fee makes this a compelling card to consider. This is the highest spending gas and supermarkets card we've come across. If you have a sizable budget on both, the small annual fee is justifiable, especially given the other perks that include a big welcome bonus and a competitive 0% intro APR offer. One of the highest spending gas and supermarkets cards we've come across with no annual fee. The big welcome bonus and 0% intro APR offer round out a diverse feature set that makes the card worth considering for a one-card wallet. With 5% back on Whole Foods and Amazon Prime Pantry purchases, this card is tough to top if those are your go-to places for groceries. It also comes with 2% back at gas stations and a nice sign up bonus upon approval. 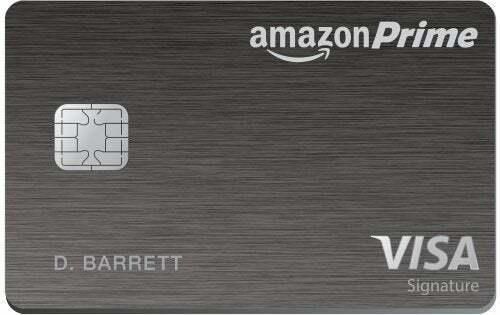 The information related to Amazon Prime Rewards Visa credit card has been collected by The Ascent and has not been reviewed or provided by the issuer of this card. Gas and groceries are popular bonus categories on cash-back credit cards, and for good reason. Plenty of people drive every day and we all need to eat, so gas and groceries are areas where just about everyone will spend at least a few hundred dollars per month. If you’re looking for the cash-back card that will score you the most back, then one of these cards could be the ticket. Is a credit card for gas and groceries right for you? We based our selections on which cards would earn the most back for consumers who have average to high spending on gas and groceries, so the most significant factor was each card’s rewards rate in those categories. Most of these cards have no annual fee, and those that do have an annual fee have rewards rates high enough to make that fee worth it for at least some consumers. We also took sign-up bonuses into consideration, factoring in both the bonus amounts for each card and how much spending was required to earn said bonus. Since I have an excellent credit score, I’m always looking to take full advantage of that by using the best credit cards to earn more rewards. I’ve used over a dozen different cards, and that includes both cash back and travel rewards cards. In less than three years, I earned over half-a-million travel points and over $1,000 in cash back while maintaining a frugal lifestyle with below-average annual spending. Credit cards for gas and groceries are cash-back cards that earn a higher percentage back in those areas. These cards typically earn 2% in one category and 3% in the other, so you could base the card you choose on where you spend more. Non-bonus spending earns a standard 1% back. If you want to maximize your rewards in both categories, the Blue Cash Preferred® Card from American Express has one of the highest cash-back rates of any credit card with 6% back on your first $6,000 in annual spending at U.S. supermarkets and 3% back at U.S. gas stations. All other spending earns 1% back. The one thing to note about this card is that it has a $95 annual fee. An alternate approach is to go with a card that has rotating bonus categories, such as the Discover it® Cash Back or the Chase Freedom®. These have rotating bonus categories where you earn 5% back up to the quarterly spending maximum after you activate your bonus. These bonus categories can include gas and groceries, but they can also be for dining, Amazon.com purchases, and other common types of spending. Statement credit -- Use your cash back as a credit applied to your statement balance. Direct deposit -- Deposit your cash back into a bank account that you’ve linked to the credit card. Check -- Receive a check in the mail for your cash back. Your card issuer may also let you redeem your cash back to make purchases through a shopping portal or to purchase gift cards from select retailers. You usually get a subpar value when you redeem cash back through shopping portals, but gift cards can be a good deal if the merchant is offering a discount. It’s common for credit cards with bonus categories to put caps on those bonus categories, and credit cards for gas and groceries are no different. These bonus caps limit how much cash back you can earn at the bonus rate per quarter or year. Once you hit your cap, you’ll earn 1% back until the next quarter or year starts. Before you choose a card for gas and groceries, make sure to check what its bonus caps are and whether it has one combined cap for all its bonus categories or separate caps for each category. The Bank of America® Cash Rewards credit card is an example of the former, as its bonus cap is $2,500 in combined spending per quarter at grocery stores, a category of your choice, and wholesale clubs. The Blue Cash Everyday® Card from American Express is the opposite, as it only caps its 3% grocery store cash back at $6,000 in annual spending. You can divide quarterly caps by three and annual caps by 12 to see what kind of monthly spending will cause you to reach that limit. This makes it easy to compare bonus caps with your usual spending and figure out whether you’ll go over the card’s cap. If your gas and grocery spending isn’t particularly high, then you would probably earn more back from a cash-back card that earns an unlimited flat rate on all your spending. A credit card for gas and groceries is the clear choice here. If, on the other hand, you had half the gas and groceries spending and $2,000 spending on everything else, you’d be better off picking a flat-rate card. If your focus is getting the most value from your cash-back card, then the factors to look at when choosing a card are its cash-back rates, the bonus caps, and its annual fee, if it has one. These three details are enough to calculate which card will earn you the most back per year. If it’s dead even, then you can use sign-up bonuses as a deciding factor. Many cash-back cards also include 0% intro APR offers for purchases, balance transfers, or both. If you need a 0% intro APR, either so you can put a big expense on your credit card or so you can transfer balances and consolidate debt, then you’ll want to go with the card that has the longest intro period. One of the nice things about no-annual-fee credit cards is that you don’t have to limit yourself to just one since you can carry them free of charge. If you don’t mind managing multiple credit cards, then you may want to think about combining some of the best cash-back cards. The most popular strategy when combining cards is getting one flat-rate card for your regular spending and one or two cards with bonus categories. It’s a simple, effective way to maximize your cash back on the money you spend. The only caveat is that you can’t miss any payments, because any fees you incur will wipe out all that extra cash back you earned.